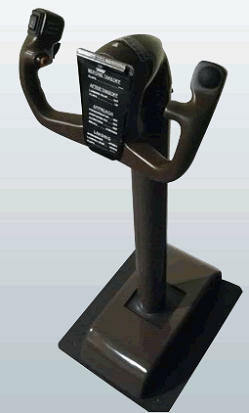 The ACE 747 Yoke (http://www.737yoke.com) is a product manufactured and distributed by Aircraft Controls Engineering located in Brampton, Ontario Canada. ACE’s offices which are housed slightly north west of Toronto, makes them one of the few Simulator part suppliers residing in Canada. 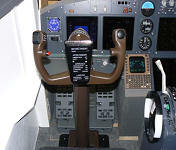 The Canadian market for simulator enthusiasts is very small, yet manufacturing costs are much lower. This allows companies to manufacture the components and resell them overseas and throughout North America at very reasonable rates. When I interviewed the owner of Aircraft Controls Engineering Ali Anwar, I asked him what he and his business strive for in this market. Ali responded by saying “At ACE, we aim to provide the most cost-effective products with the best service and support in the industry”. This is a pretty tall order for a new company in this market place. I mean really Ali, and the ACE Team are effectively competing with companies who have known this industry for many years. (CSI, Flightdeck Solutions, etc.) The real question that this review will answer is, does ACE have what it takes to successfully create a product that will survive in this hobby. If so, what does ACE offer that other suppliers do not. It is and will always be the MyCockpit® philosophy to do these reviews in comparison to their real world counterparts. This review will be no different then that, although one question arises in every customers train of thought when making a purchase of this magnitude. That question is “How does this product compare to others on the market?” I personally have used many of these kinds of products currently on the market, (Ch Products, PFC, and many others). When working on this review I couldn’t help but use my past experiences as a benchmark for the tests that I performed on this product. I will conclude at the end of this review my personal experiences with this, and not only will compare it to the real world counterpart, but I will also state my personal feelings in comparison to other products on the market today. REMINDER: The purpose of the product review is to describe the features, functions, ease of use, and quality of this hardware component as an independent entity. When I placed my order with ACE, I found their customer service staff to be very helpful and diligent. As with most simulator parts on the market today, the majority of companies build to order. I expected a lead time of up to a month, however to my surprise ACE was different. They actually had stock of the product and shipped it within 2 business days. I am told by ACE Staff that normal shipments to North America or Overseas, would be by way of DHL/UPS. Because I am within Canada the shipment came by way of Canada Post. I received the product 2 days after it was shipped which is standard delivery time from Brampton to where I live. The yoke arrived in a ½” plywood crate measuring 19” X 38” X 16”. (See picture) The crate was held together with 1” coarse thread wood screws and had packaging tape around all the seams. Using a knife, I cut all the tape and unscrewed all the Phillips screws with a power drill. Once the lid was removed, I could see the yoke laying on its side supported by a Styrofoam base. The glossy finish of the metallic parts immediately encouraged me to touch the unit. Sliding my fingers all around it, I could tell this product was smooth as silk. No flaws in the paint or in the assembly were noticeable. It looked like someone just shipped me a brand new control column out of a 747. The yoke had not moved or shifted in transport, although if the unit were to have been shipped overseas, it may have benefited from some screws through the base securing it to the crate. The Styrofoam support was hot melt glued to the crate so that it could not have come loose, but that would only stop the unit from sliding left or right. Movement up and down could have still occurred. Inside the crate with the control yoke was 3 sheets of paper; a note to the customer thanking them for their business, a detailed list of Frequently Asked Questions, and a Quick Setup guide. ACE does not include a USB cord with their product, so you must have a cord in your possession to connect the unit. Once I removed the unit from the crate, I inspected it in detail. The first thing I noticed about the product was how level it sits on the floor. Many products on the market today that stand on the floor have some warping or bending of the base. This unit had none of that, and sat true to the floor. The unit was very heavy. In fact with an all metal construction I was still surprised by how heavy the unit was. I am a firm believer in the age old saying (the heavier an item is, or feels, the better the construction). If this is the case, this unit is put together well. After grabbing hold of the ram horns the left and right aileron movements have an amazing hydraulic feel to them. I would guess by the tension on the unit that it has heavy duty rubber inside that creates this feeling. The forward and backward motion is very stiff, but I can picture it loosening up a bit with added use. 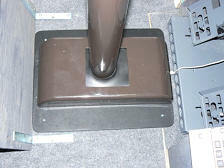 For this reason in order to properly use the Yoke, it will require 4 screws through the base of the yoke into the floor. These holes are provided by ACE and will allow you to get full deflection of the Elevators. Looking at the ram horns explicitly I do notice that the unit compared to its real world counterpart is a bit different. In fact the shape of the control compared to the real unit is identical; however the switches fitted into the yoke are slightly different. For instance, as you can see form the picture, the ACE 747 Yoke has a single rocker switch installed in the left hand thumb position. The real 747 yoke has Dual rocker switches with a guard around them requiring SYSTEM A and B Trims to be pushed at the same time in order to trim the elevator. This is not the case with the ACE yoke, however from a functional point of view the switch ACE has fitted is very heavy duty and works effectively. The Push to talk buttons/triggers on the yoke are spring loaded high quality switches, and accurately represent the real thing. However, with all that being said the only complaint I have is regarding the Autopilot disconnect switch which is red in color and is a push on push off latching action to it. I would like to see this switch changed for a momentary black push to disengage switch. Although when it comes to programming this yoke in FSUPIC I can change the switch functions, so it really isn’t a functional concern, just something I would add to my wish list. The degrees of bank indicator strip that is affixed to the top of the column is actually printed on a clear sticker and stuck to the top of the unit (very cleanly). I would like to see this strip silk screened onto the metal housing personally, but in order to keep costs down, the solution the ACE team came up with here really adds that little bit of eye candy to assist in the realism. Upon a close inspection of all the switches, it is clear that the ACE team took their time to choose the switches carefully. All are made of high quality plastic, and in fact are the only 2 parts that are plastic on this unit. The switches and the base cover are the only two items in the entire setup that are not metal or Cast Aluminum. The switches do sit a little proud of the Yoke, but really this is not that noticeable unless your in a bright light atmosphere. The yoke has a professional finish and look to it, and let’s not discount the feeling of an all metal control in your hands that feels like the real thing. With regard to the chart holder on the yoke, it is attached to the yoke with rivets/welds, and is sturdy as can be. The clip itself is of excellent quality and will easily hold a single chart, or even several charts and a map. The only downfall with this part of the yoke is I found it hard to read the charts when they were clipped to the unit because the chart holder is mounted flat to the yoke. It would be handy if this chart holder had a bit of an incline to the mount so that charts would sit on a bit of an angle which would make reading them much easier. Following the setup guide I loaded Windows and connected the Yoke to the computer. Instantly the Yoke was recognized by the operating system as a Plasma card (Beta Innovations). I am not sure if this is the type of interface that is installed in the base of the unit or just the driver that is loaded into the firmware on the card. For any of you that have been in this hobby for a while you have come to know of the Beta Innovations name, and the quality that rides along next to it. Why re-invent the wheel here. We are talking about a full speed USB 2.0 HID compliant device with 10-bit resolution (1023 steps) USB Firmware updates, and let’s not forget bullet proof digital filtering algorithm support. Once I calibrated the unit through the Windows Vista calibration screen, I launched FSX and couldn’t wait to see what was in store for me. A double check of the FSX configuration screen under Joystick assignments, Microsoft assigned a bunch of useless functions to the buttons on the yoke. Trim switch was assigned to views, and the Microphone switches were assigned to brakes etc. The best thing to do here, as I would recommend with any control device is remove all the joystick button and axis assignments from Flight simulator and program and calibrate the unit through FSUIPC (Peter Dowson). I assigned the switches and their functions through FSUIPC and was surprised at the accurate resolution on the aileron and elevator movement. Very smooth operation. In fact I actually had to tighten up the response curve of the axis movements because they were almost to smooth. Saving my settings and returning to the cockpit, I launched my favorite aircraft and took off down the runway. Gently pulling back on the control column the aircraft smoothly lifted off the ground. I found the column very heavy to hold on to, and simple adjustments of the trim with my left thumb allowed me to return the column to the center detent and continue my climb. The feel of the cast Aluminum at your fingertips adds to the realism of this product immensely. Depending on the aircraft you fly most of the time you may or may not want this kind of feel in your hands, but if you fly an airliner it is a feeling that you must have. Continuing with the main purpose of this review, and answering the common question if this unit is an accurate representation of the real thing, I can safely say that yes indeed this unit accurately represents the real 747 yoke in 85% of it’s details. As for the $1150.00 USD price tag on this unit at the time of this report, it is well worth every cent. With this all being said, I personally feel that for the price you are getting a very accurate representation of the real McCoy. In fact, such a real representation 8 out of 10 average people wouldn’t be able to tell the difference between this unit and its real life counterpart. Based on my personal experience some uninformed people are going to say that $1150.00 is way too much money to spend on a Joystick. I would have to agree, if when you look at this product all you see is a joystick, then this is not the product for you. But if you are striving for a high quality real life replica for your simulation experience, this is the product for your setup. Keep in mind it is those people that have never held the real thing in their hands to know what a difference an all metal accurate construction makes. Anyone who is used to $15.00 Joysticks or $170.00 off the shelf yokes may consider this price point out of their league, but until they experience what a product like this has to offer in realism and reliability, they don’t know what they are missing. This unit is cast aluminum and 90% metal. This unit will withstand years of real life abuse that other units won’t begin to stand up to. It strictly would not be realistic to compare this yoke (a professional product) to an off the shelf model or mass produced plastic yoke. In fact the only other product that I am aware of that I believe you could even compare the ACE Yoke to would be the 737 or Jetliner Yoke’s from PFC. In either case this yoke is more affordable, and is more of an accurate representation of the real counterpart then anything in the PFC product line. Ali Anwar reports that ACE will provide the support and warranty services for any of their products for a period of 1 year from purchase. Following that, customers can have ACE repair their products with a negotiated price in advance and can have comfort they are dealing directly with the manufacturer. Although there should be no reason to ever need this warranty service, it is a good feeling knowing that you will have that extra help when you need it. LIKE’S: I absolutely love the robustness of this unit. It is built like a single solid component. The feel and handling of this unit is second to none in my experience. I can’t imagine ACE making any changes to this unit to improve it or its operation. I believe ACE has developed a reliable and let’s face it, incredible unit. It appears to have been designed to withstand years of use and enjoyment. Once installed, no maintenance should ever be required. I like this product because it is the type of product that shouldn’t ever stop working. It should continue to work as the day you bought it for years to come. I personally am 110% satisfied with this purchase, and can’t imagine any avid simulator enthusiast being anything but ecstatic over this product. 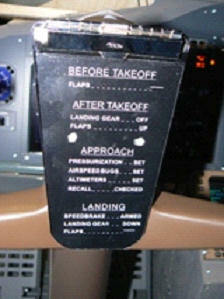 If you fly the Big Tin, this is the control yoke for you! DISLIKE’S: I would like to see the autopilot disconnect switch exchanged from a push on – push off switch to a momentary switch and I would replace the red cap on this switch with a black cap. CONCLUSION: The ACE 747 Yoke is a must for any airliner enthusiast. This unit blew me away with its quality and construction. In essence you are truly flying the “BIG TIN” with this yoke at your fingertips. I understand that the price tag may be high for some of you, but I assure you that you are getting what you pay for when it comes to quality, and realism. Based on similar products in the marketplace, this unit wins hands down, and at a lower cost then its comparables. ACE has the drive and the conviction to ensure every customer is satisfied with their products. They have the experience of industry experts, and the willingness to succeed. ACE has a successful product line that speaks for itself, and the customer service to allow them to remain in business for years to come. Please understand when you are contacting ACE, give them ample time to return your emails, as they are quite busy. But I personally found the communication with them similar to all other companies in this industry. What are you waiting for…….? 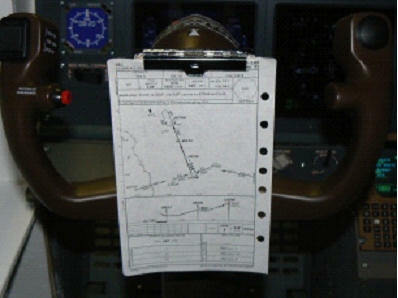 Order your ACE 747 Yoke today!